Safeway Ad is one of the greatest weekly ads that focus on grocery and weekly home supplies sales. Mix and match, BOGO Free, coupon savings are basically kinds of discounts you can find in this weekly ad. Check this page to catch the deals like them from Safeway grocery. You can sometimes find discounts for seniors and veterans. The store has 900 locations in west and central America. Their product range covers deli, grocery, bakery, dairy, frozen foods, meat, pharmacy, and more categories. Recently, the store improved and enlarged the organic food range. Now, you can find a lot of O Organics label on many food items. Safeway weekly ads can be more than one every week. Sometimes they offer extended range of products that are on sale. It can be fresh produce with multiple-buy deals or special discounts for a longer time than a weekly ad. For example, “Big Book of Savings”. The real big deal of Safeway Weekly Ad is BOGO Free Mix and match sale. Best foods ketchup or mayonnaise is one of the Monopoly Bonus ticket item and participating to the mix and match sale. Coca-Cola, 7UP, A&W, Sunkist, Soleil, and more are available in the latest Ad. Get 3rd Tree Top apple juice after buying 2 of them. Safeway Ads are also simple tools to find some deals on canned foods and packaged meals. Progresso Soup is gonna be Buy 2 Get 3 Free. Stock up savings on household items are also profitable discounts. Tide laundry detergent is a digital coupon saving. Just for u coupons will lower the price of these by $2 or $1. Buy your favorite fresh fruits on Friday April 5th. Primo Taglio pan roasted turkey breast or signature mild cheddar cheese is only $5/lb. Clip or Click coupons are also viewable on pg 2. Subscribe to get emails and follow our Facebook page for news tracking these deals and future ads. The latest Safeway Ad is a multiple-category sale that contains fresh products, Lenten seafood, meat, beverage, snacks, household supplies, and organic foods. Save with Buy 2 Get 3 Free deal of Safeway. Pepsi, Dr. Pepper, Lipton, PureLeaf tea, or refreshe are participating in that mix and match sale. Eat organic with low prices from weekly ads like Safeway. O Organics or Signature select coffee will be $3.88 each. Save with Club price with Friday-only sale. Signature Cafe 8-piece dark chicken and other food or household items will cost $5 each on Friday. Buy frozen fruits for 30% cheaper price which is a Club Price. The same deal is valid for Amy's products. Use a clip or click! coupons to save on food. Lucerne milk with its different versions will be $.99 (Club Price). 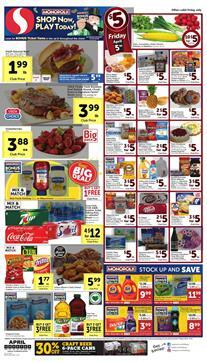 Prepare a great table with meat variety that is available on Safeway Ad pg 3. Fresh beef chuck 7-bone roast will cost $4.99/lb. The same price is also valid for more products. Deli meat is there for you to prepare great sandwiches. Moreover, you can cheaper grocery products with Buy 4 & Save deals. 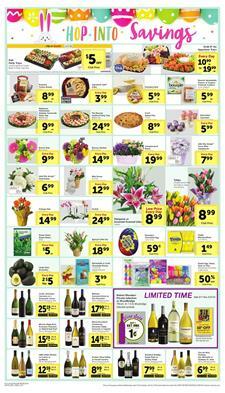 Check out some of them on the list, click on the image to the browsable weekly ad of the Safeway. Some products are really profitable because they have tags of several different deals. For example, 7UP, A&W or Sunkist is a Monopoly Bonus Ticket Item, mix and match deal and it's 3 for $11! Many more are available in this sale and the others from the weekly ad. Safeway Ad has a great range of products including the participating ones to the Monopoly Bonus Ticket item. 10% off on frozen food, BOGO Free deals, general grocery, big packs, snacks, and all favorites are in the ad. Important Multiple-buy deals from the cover page are Coca-Cola and Ice cream products. Ben & Jerry's, Blue Bunny, and more favorite brands are on sale. Save on pantry or sauces with the mix and match sale, too. Buy Best Foods mayonnaise or Ketchup with BOGO Free mix and match sale. Just for U coupons are also on the ad. 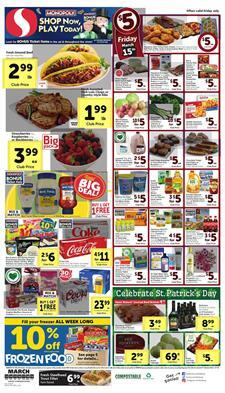 Visit pg 2 for the coupons from Safeway Ad Mar 13 - 19. Signature Farms corned beef brisket is a popular product in most weekly ads. It will cost only $1.99 which is a club price. Browse the ad for more products. Celebrate St. Patrick's Day with these foods. Nice deals are available. Subscribe to the newsletter to get emails about the future ads, too. Enjoy shopping with Safeway Weekly Ad.